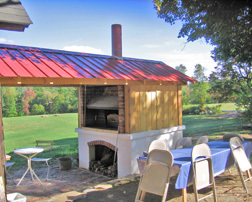 The wood fired oven at the Garlic and Arts Festival was built in 2008 for use at the festival and for the local community. It is used for baking loaf and flat breads like foccacia and pizza and for preparation of many other types of dishes. It can roast and even grill using the coals from the fire in the oven. We in the neighborhood have potluck dinners there at the oven in good weather. At the festival the oven will be running the whole time and cooking and baking different breads and other dishes. Everyone in encouraged to come and visit and see it in action. 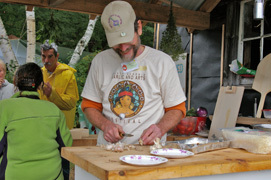 The oven uses volunteers during the festival and people with experience or a strong interest are encouraged to inquire about volunteering at the oven during next years festival. Products from the oven are exclusively for festival volunteers. Participate and be a volunteer! The oven is built to an ancient Italian design fundamentally the same as larger ovens that still exist in the Pomp ei archeological site. There are many thousands of similar ovens in Italy today where backyard cooking and roasting is very popular. There have been similar ovens in many parts of the world for millenia along with other forms such as the pit and open topped ovens in Central and South Asia. 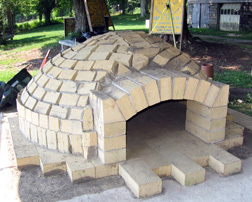 Our oven is made of firebrick but similar ovens are made of clay mixtures such as those in Quebec and the Navaho ovens. The fire is built right in the oven chamber and heats the masonry or clay directly. Then the fire is removed or maintained in a smaller form in the oven and the residual heat cooks the food. These ovens heat food in three ways. There is direct heat from the floor or hearth of the oven, this is heating by conduction. This heat is excellent for flat breads and loaf bread and helps give the open texture so desired in hearth breads. There is heat radiating from the dome and floor of the oven and this radiant heat cooks like a broiler and with bread gives an exceptional crust. Finally there is heat in the air of the oven and this is conducted to the food by contact. This last type of heat is the principle way that conventional modern ovens heat and it is not nearly so effective as the hot hearth and strong radiant heat combination of the masonry oven. Another aspect of the masonry oven is that it attains much higher temperatures than typical modern ovens and though this can be an issue with some very sensitive dishes, most foods can tolerate the greater heat and cook faster and better with it. This oven gives superior results not only with bread but all sorts of dishes that are typically cooked in an oven or on the stove top in a covered pan. Ideally the oven would be fired every day and the residual heat, and even coals, from the previous days fire would make the heat up time shorter. Firing from a cold oven, particularly in the winter, takes several hours with a strong fire. 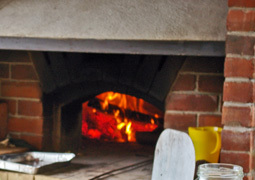 We usually maintain a small fire in the oven like the wood fired pizza ovens do here and in Italy. There are several advantages of this method. The fire lights the oven, which is very handy. It adds radiant heat and maintains the heat of the oven indefinitely and it can add a slightly smokey grilled flavor to the food. Production wood fired bread ovens have very thick domes and hearths and are cleaned out after the firing to maximize space on the hearth but still retain sufficient heat to bake many loads of bread for up to 6 hours or more of baking.